Douglas SBD-3 Dauntless dive bombers of Marine Scouting Bombing Squadron 241 (VMSB-241) on patrol after the Battle of Midway. In May 1942 this squadron began to transition from the obsolete Chance-Vought SB2U-3 Vindicator to SBD-2s handed down from the Navy. USMC Major Lofton R. Henderson split his squadron into two flights, one with SBDs and one with SB2Us. 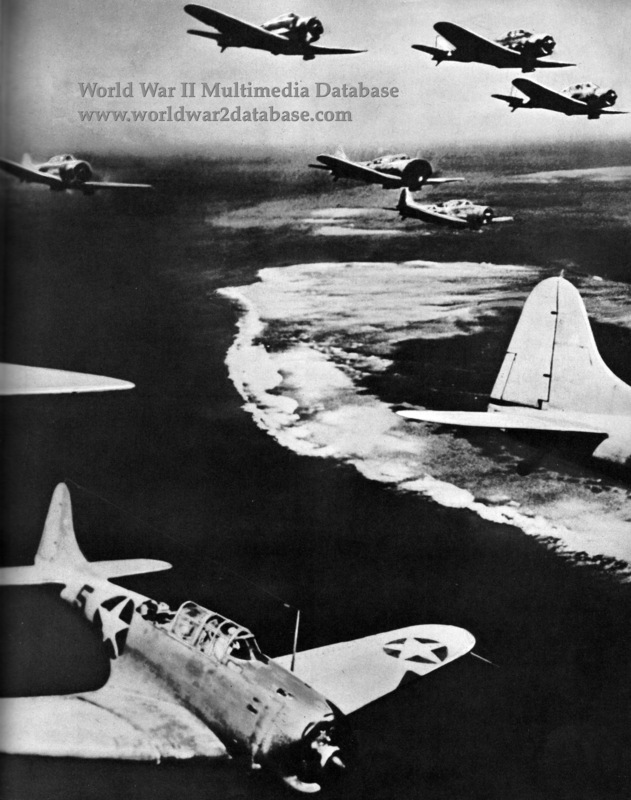 The squadron suffered heavy losses as the SBD pilots had no time or fuel to familiarize themselves with the new mounts, and the SB2Us were too underpowered and lacked self-sealing fuel tanks to serve in aerial combat against the Mitsubishi A6M2 Zero-Sen (Allied code name "Zeke") fighters. Major Henderson and many others were killed; VMSB-241 had three commanders in as many days of fighting. By August 1942 the squadron received the updated SBD-3, and the old SBDs and SB2Us were withdrawn. The squadron continued to operate out of Midway until November 1943, when it moved to Ellice Island (present-day Tuvalu). In February 1945 VMSB-241 operated as part of Marine Air Wing 1 providing ground support during the invasion of the Philippines. The Douglas SBD Dauntless was one of the first successful combat aircraft designed by the famed aeronautics engineer Edward H. Heinemann. Nicknamed "Slow But Deadly" by Navy pilots and the "Speed Bee Dee" by Marines, it was often pressed beyond its design limits, especially during the first six months of the war, when it served as a fighter during the Battle of the Coral Sea. The type sank all four Japanese carriers of the First Air Fleet during the Battle of Midway on June 4, 1942. SBDs were the standard carrier-borne dive bomber from 1940 to 1944, when it was replaced by the Curtiss SB2C Helldiver.